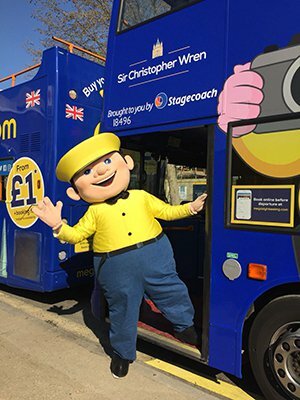 Perth, Scotland, 2018-Apr-24 — /Travel PR News/ — Industry leading transport provider megabus.com has today (23 April 2018) launched London’s first low-cost sightseeing tour. From today (St. George’s Day) visitors to the capital will be able to use the great value service to take them across London to view 50 of its best known sights. The new service does a circuit of London without stopping, so customers get to see the sights rather than waiting for other customers at each stop. With ticket prices starting from only £1** passengers will get to view sights like Big Ben, the Tower of London and the London Eye from only 2p a sight, all from the comfort and convenience of a megasightseeing.com bus. A family of four can take the tour during the peak time summer holidays for as little as £8. At such a low cost, tourists, local residents, schools and community groups can take advantage and book for a fun-filled, informative trip without breaking the bank. For families stay-cationing in the UK this summer, they can also use low cost long distance operator megabus.com to travel to London before jumping on board megasightseeing.com for their two hour adventure. With tours departing every hour from three different locations across the city, the bespoke double decker buses will offer great views of all of London’s top tourist attractions. Tours depart from Stop X in Park Lane opposite the Hilton Hotel, Stop TA at Tower Hill and next to the railway bridge on Belvedere Road near the London Eye. Seats can simply be booked via the megasightseeing.com website and can be reserved right up to the time of departure (subject to availability), offering customers great flexibility and the option of a guaranteed top deck seat. The sightseeing tours – being operated by Stagecoach London – will run daily between 1000hrs and 1700hrs with additional services available during the busy seasons. Nine vehicles, all Dennis Tridents have been adapted by manufacturer Alexander Dennis Limited (ADL) in Anston and Harlow. Four vehicles are fully open top and five offer a partially covered top deck. A GPS commentary system provides a comprehensive English-language commentary of all of the sights through interior speakers. ***£81 includes megabus.com tickets from Liverpool to London on 30th July, a sightseeing trip at 1000hrs on 31 July and overnight accommodation in a family room at the Premier Inn at Stratford, London on 30th July. All priced at 1230hrs on Friday 20 April. King Henry VIII, Sir Christopher Wren, King George V, Queen Elizabeth II, Lord Nelson, King Charles II, King William I, Sir Winston Churchill, Queen Victoria. All of the below prices are for travel from city of origin to London on 30th July, returning on 31st July, with overnight accommodation in a family room at the Premier Inn in Stratford, London and a tour on megasightseeing.com at 1000hrs on 31st July. The prices were accurate at 1300hrs on 20 April 2018. Office hours (0800-1800): + 44 (0)1738 442111 (Please note – our communications team is not based in one office so this number is for our switchboard, who will note your enquiry and pass it on to the media team). Alternatively, please contact us via the email address below. This entry was posted in Attractions, Tourism, Transportation, Travel, Travel Services, Travelers and tagged Mark Venables, megabus.com, Paul Lynch, sightseeing, sightseeing tour. Bookmark the permalink.